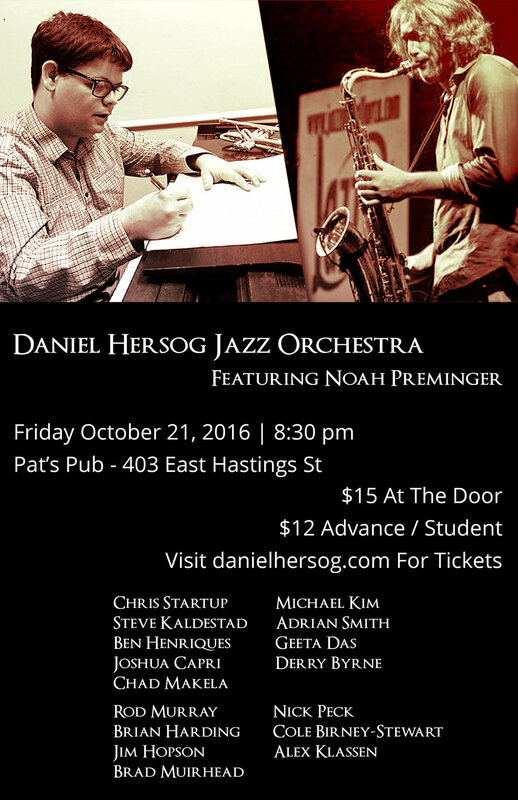 East meets west, New York City meets Vancouver, and Tenor Saxophonist Noah Preminger meets the Daniel Hersog Jazz Orchestra. Noah Preminger, just 29, has recorded numerous critically acclaimed albums and is steadily listed as one of the best tenor saxophonists by critics and readers on the annual Downbeat Poll. He has played with the likes of Billy Hart, Dave Holland, John Patitucci, Fred Hersch, Dave Douglas, Rudy Royston, Joe Lovano, Victor Lewis, John and Bucky Pizzarelli, Billy Drummond, George Cables, Roscoe Mitchell, and Dr. Eddie Henderson. On October 21st, Noah will join a band of Vancouver’s finest players performing Hersog’s exciting and swinging compositions. “Almost all of this music was written with Noah in mind” says Hersog. The band will be premiering a three part suite of music written specifically for this occasion.